GC The Nature Trail’s Myrddin has an incredibly wide head. He’s really showing that “mass” that you look for in a holland lop buck. As you can see from the pictures at the left, he had a narrower head as a junior, but it still had very good width to the muzzle and grew into the hunk of stuff you see in the senior pic. 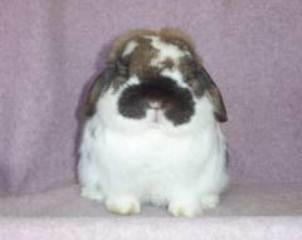 Myrddin has a good wide crown to balance and good stumpy legs: something you look for when judging holland lop rabbits. He has excellent width to the chest. He also has a nice short body and good depth. 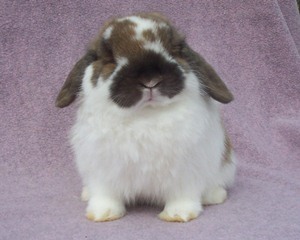 This is a Holland Lop senior buck of excellent quality. Even when Myrddin was just a baby, he was adorable. Normally, I wouldn’t take such a baby to Nationals, but I had to scratch my broken junior buck, so I figured why not. Myrrdin is out of GC Camelot’s Merlin and The Nature Trail’s Estella, a Styles Stella daughter. I knew that Merlin and Stella worked well together, so I hoped that Merlin and Estella would as well. His major fault is long fur. The undercoat is long enough to knot. My friend Lisa thought he’d be a fuzzy. He didn’t go fuzzy, but I’m pretty sure he’s a fuzzy carrier. I knew I was going to have to sit on him for quite a while until he was ready to be competitive again. It looks like his time may be coming soon. He has the best depth and width for such a short, short buck. And I love his head, ear, and crown. In fact, I’m totally in love with this boy! He granded as he approached 18 months. As with many smaller bucks, he had to wait for all of his maturity before forging ahead. Myrddin as a senior -- see that huge face?